I've always been a fan of white wines made from the Verdejo grape. It's the signature grape of Spain's Rueda region, located in the northwest part of the country. Most of my experience with Verdejo reminded me of Sauvignon Blanc: a crisp, dry, easy-drinking white without a whole lot of complexity or richness. Nothing wrong with that; they are fantastic to guzzle all afternoon in the summer. When I received a sample of the Shaya Verdejo, however, I had to adjust my thinking about this heretofore (to me) humble grape. I am guessing this has to do something with this being an wine made from (as so proudly noted on the label) "Old Vines." Purportedly, older vines produce wines with much more complexity. 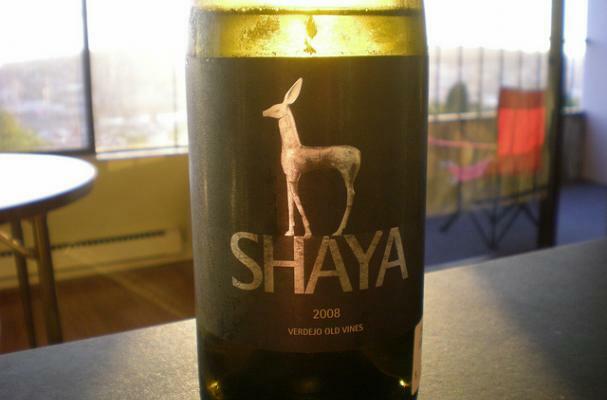 The Shaya certainly had a richness and flavor profile much more pronounced than most deck-chugging Verdejo. This is where the intellectuals of the wine world will start throwing out descriptors like "minerality" and the hallowed mantra of terroir. Terroir is a French term (naturally) that purports that location, weather, and soil all bring intrinsic properties to a finished wine; a terroir-driven wine has a sense of place. The poster child for terroir is probably Chablis, where the Chardonnays are said to have a (wait for it) pronounced "mineral" quality from the flinty/chalky/fossilized soils. (Full disclosure: Chablis is a desert island wine for me. I absolutely adore it.) I'm a bit of a wet blanket when it comes to terroir. The New York Times, and food scientist Harold McGee, got the ball rolling on this debate in 2007. If flavor is transmitted from soil to roots to grapes to finished wine, then if I grow tomatoes in Chablis will I be talking about how they taste like minerals? (Gross.) And since wine is a highly manipulated, fermented product, how does it retain any sense of where it came from? Wines like the Shaya, from the Jorge Ordonez portfolio, have been placed at the forefront of this debate. For some reason Jorge Ordonez wines have become the whipping-boy for proponents of terroir. They are accused of a litany of heinous wine crimes: not reflecting their place of origin, homogenized in flavor, and tailored to suit unsophisticated palates. (If you want to read the perspective of the vanguard of the terroir movement, I suggest you join the e-mail list of Garagiste. You'll get an e-mail a day lengthy and verbose enough to have made Norman Mailer blush.) If that's the case, then I will happily rub elbows with the simpletons of the wine world, who want their wines interesting, tasty, and maybe to come with a label that has some eye-catching sizzle on the dinner table. OK, stepping off the soapbox; let's wrap this up and put a pretty bow on it. The Shaya, and Verdejos in general, are great seafood wines. They are also equally delicious outside on a deck, patio, or (as pictured above) in a red chair on the balcony. Do you have a spam issue on this website; I also am a blogger, and I was wondering your situation; we have developed some nice procedures and we are looking to swap techniques with other folks, please shoot me an email if interested.